Since the release of Scary Modsters, I’ve been repeatedly asked why I made deceased rock star Peter Lane a mod instead of going more modern. The only way I can answer that question is by looking to the future via the past. In the early 1960s, we were still getting out of the bobby sox and saddle shoes phase and were looking to Jackie O for style tips. Fashions weren’t exactly risky. When Peter’s popularity started, all of that was changing. Dame Mary Quant, a fashion designer out of London, created revolutionary styles, color combinations, and high hemlines. All of those things have never left us. The mod look propelled fashion forward and signaled that the world was changing. It was sort of the shot heard around the world. There is a misconception that the scooter-loving mods were rich kids while their rivals, the motorcycle-riding rockers, didn’t have money for fancy clothes. In talking to people who were there (and who still consider themselves mods), it seems that isn’t true at all. The mods were just as working class as the rockers, but their priorities were different. Because they didn’t believe in wearing something that they considered undesirable when they could do better, mods went out of their way to get the most fashionable clothes, even if they could not really afford them. It seems that every twenty years we revisit an era. The poodle skirts and saddle shoes of the 1950s came back in style in the late 1970s when rockabilly hit. 1960s fashions became popular again in the 1980s during the new wave revolution. In the 1990s, stores were flooded with bellbottoms and flowing shirts that were all the rage in the 70s. In the first decade of the current century, we saw an 80s new wave resurgence. Now we are due for a 90s resurgence, which puts us at grunge. The problem is that grunge’s casual look never truly went away. Also, the 90s weren’t very interesting fashion wise. So where do we go from there? It seems only natural that we would look back to the revolution—the 1960s. Everything old is new again. 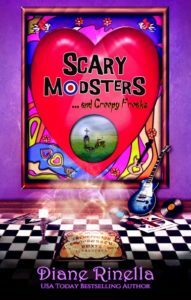 Tagged 1960's, British Invasion, creative writing, independent author, magical realism, metaphysical fiction, music, pop, rock, Scary Modsters, self discovery, self publishing, visionary fiction.